I don’t often seek out the darkness. Normally, I like to see what I’m doing. I can’t imagine what it’s like to live in all those endless days of tundric winter gloom in the Arctic Circle. Northumberland is quite dark enough for me this time of year. But the other week Mrs Diner and I had friends up from London, and they expressed a desire to go to Kielder Observatory for an evening of stargazing and galaxy hunting. Kielder is famous for its darkness. Our friends told us that Northumberland International Dark Sky Park is, at 580 square miles, the fourth largest area of certified Dark Sky Park in the world; it sounded very impressive. Apparently, when the elements are in your favour, it looks impressive too. So we agreed to take them, on the proviso that we had a hearty dinner first. You can’t go peering into the cosmos on an empty stomach. At least that was my excuse for organising our pre-observatory meal at the Pheasant Inn, a 17th century pub some 10 miles shy of Kielder. Had we arrived during daylight I’m sure we’d have taken in the lovely panoramic views. Given the gusty, pitch-like conditions outside, it was just nice to escape the elements into a room that was the very fantasy of a cosy country pub. 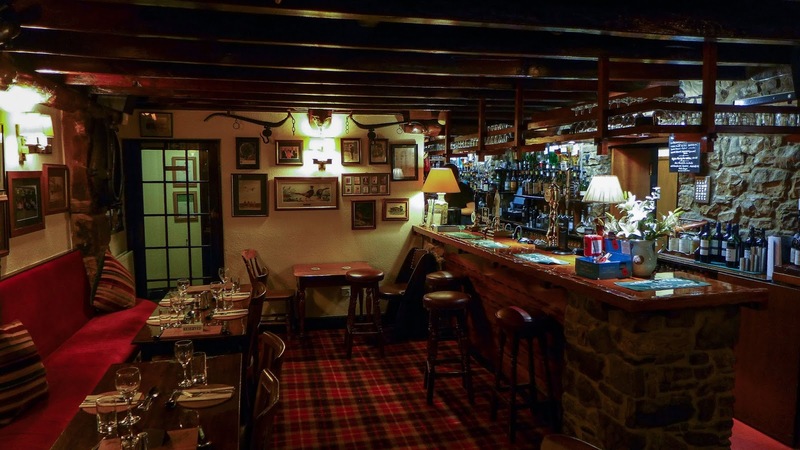 It was like stepping into a scene from one of those 1940s British films, with a stone-built bar next to a roaring fire, huge wooden beams and walls hung with strange rural ephemera. Before placing our order, we passed the time guessing the purpose of some of the weirder antique agricultural contraptions on the walls. I wouldn’t want to be a sheep round here, that’s for sure. 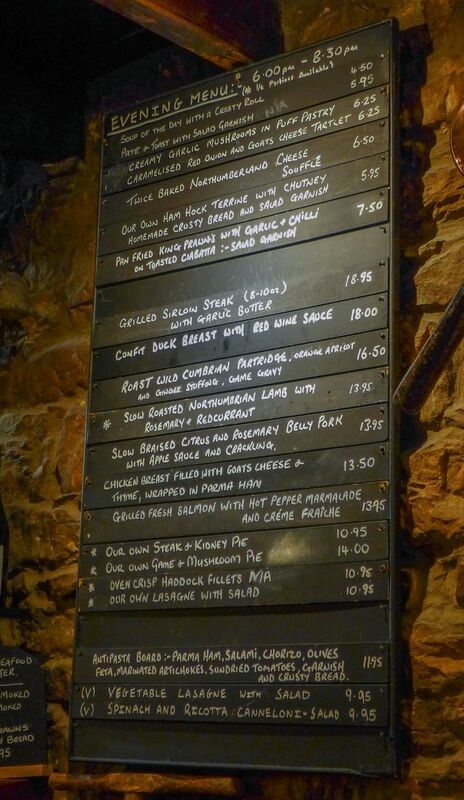 A chalkboard was marked up with a fine-sounding selection of rustic fare including, thank our lucky stars, roast partridge and a game pie. 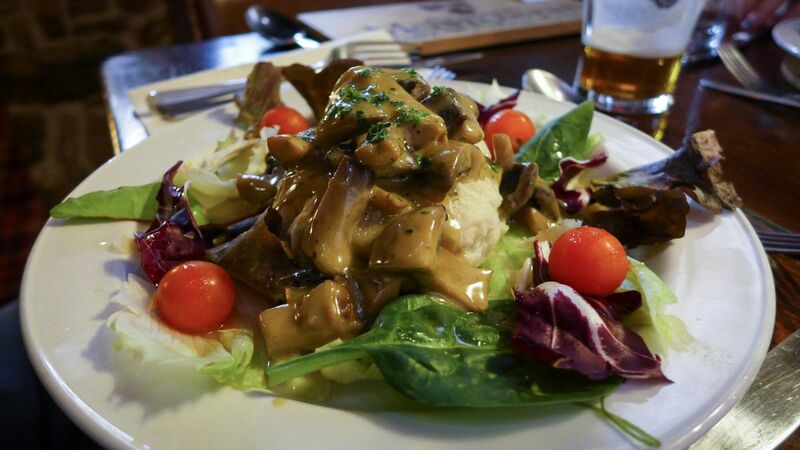 Tis the season not to be a game bird, and regular readers will know how insistent I am that any Northumbrian country pub with the temerity to blather on about local and seasonal must have something shot on its menu. 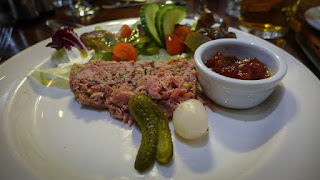 There’s nothing more seasonally local than roast partridge, in or out of a pear tree, so naturally I ordered it, but before that there was ham hock terrine to enjoy, its pleasingly fatty richness offset with capers and accompanied by a good chutney. 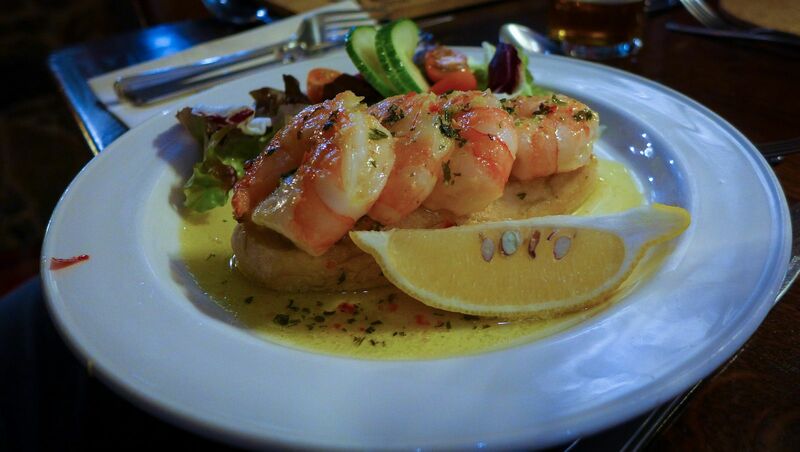 Meanwhile, Mrs Diner’s king prawns were whoppers and had been sympathetically pan-fried with garlic and chilli before being stood to attention on a wodge of toasted ciabatta. Our Southern contingent, discerning palates both, had selected an anaemic twice-baked soufflé that was judged a bit lacking in cheesy tang, and a puff of pastry with some quite serviceable garlic mushrooms. One of the Southerners was a vegetarian, and had been impressed with the choice available. For my part I was pleased to see a pub not reliant on the deep fat fryer in order to get first courses out of the kitchen in a hurry. As usual (well, for the fourth week in a row) Mrs Diner won 1st Prize for Best Main Course, having selected the braised pork belly. 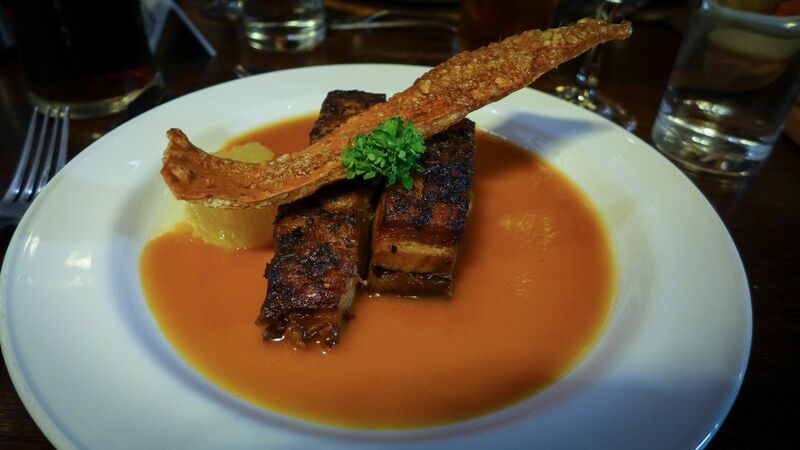 This arrived as two fine slabs of rich and spoonable pig reined in by an almost Christmassy citrus sauce and crowned by a length of proper crackling. Delicious. My roast Cumbrian partridge and my friend’s main of chicken breast both had similar treatments – they had been boned, stuffed and wrapped in parma ham before hitting the oven. The partridge had good flavour, but was a touch dry in spite of its porky coat, while the orange, apricot and ginger stuffing was a little too racy for the relatively mild meat. The bird was served on a crouton that should ideally (in my perfect pub world) have been topped by a pâté of its innards, but at least it performed the function of soaking up the moat of a light but lively game sauce. 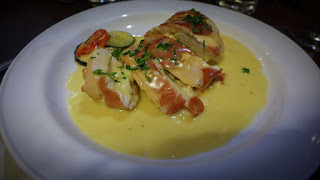 My friend’s chicken was commendably moist, although any flavour was a bit lost to its goat’s cheese and thyme stuffing. Of the steamed vegetables served on the side, smartly braised red cabbage stood out. 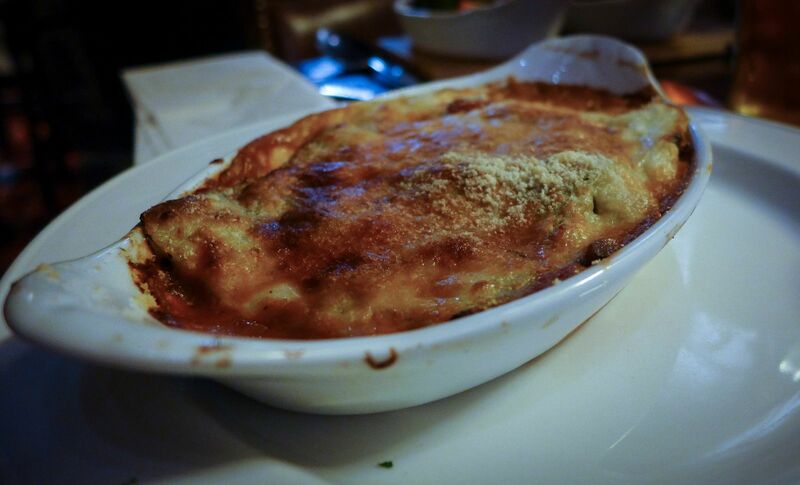 Meanwhile, a lasagne of mostly Mediterranean vegetables was judged to be a competent, homely affair by our travelling vegetarian. Competent and homely are probably the two words that best sum up our meal. 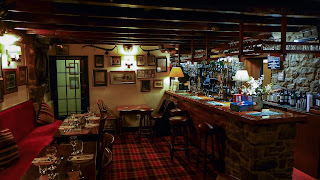 Nothing fussy or fancy, but pretty much spot on for a country pub on a cold, early Winter evening. 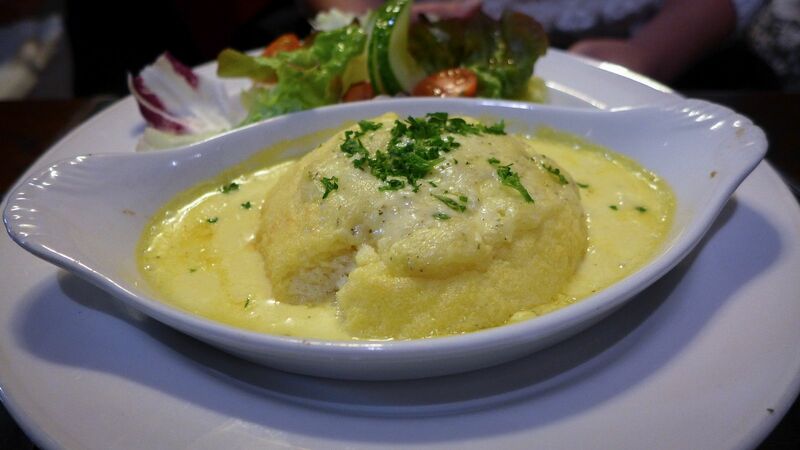 We would have liked to have sampled a dessert or four, for the menu included a steamed pudding of this and a crumble of that, but sadly the clock was against us and we had to drive on to our appointment with the cosmos. Service had been welcoming and friendly, if not exactly brisk, although in fairness we had arrived a few minutes later than planned. Rather than drinking wine, I spied Wylam’s Galaxia ale on the beer menu, which was both appropriate to the theme of the evening and also very palatable. It had been well kept – the pub has a reputation for good cask ales. As it transpired, the weather was not quite in our favour and the skies remained stubbornly cloudy all evening, clearing only just long enough to permit the viewing of a couple of shooting stars and a few quick squints into the inky depths of time and space using the observatory’s impressive kit. The preceding meal was, however, worth the trip. 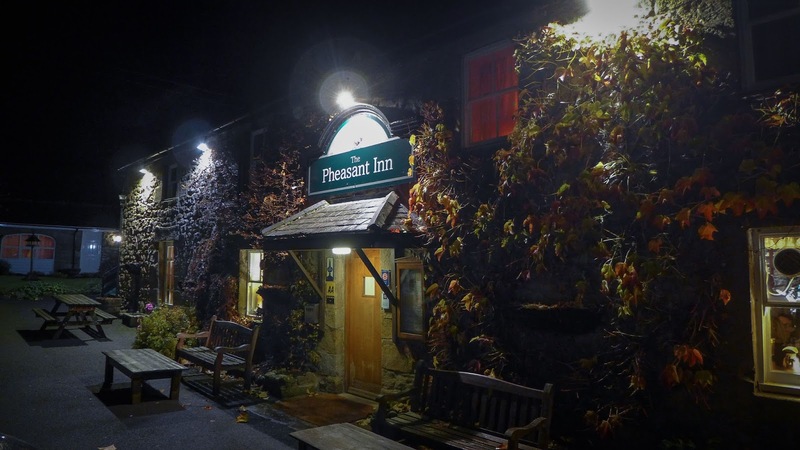 The Pheasant Inn is a proper pub, with proper food, and definitely worth making a detour for, even if you’re not star-gazing. Reasonable value, too, at under £25 per head including beverages. I wouldn’t call its cooking interstellar, or out of this world, but it was certainly starry enough to get a Secret Diner 3* Recommendation. Which, for a pub in North Northumberland, is praise indeed. 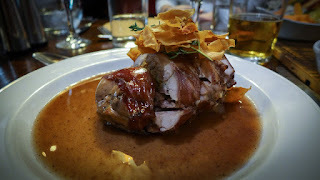 I've stayed at The Pheasant three times and I can't recommend it enough. The whole experience is without one of the best I've ever had when it comes to catering and the friendliness of the staff is a welcome change in these times to some other so called better establishments. I will be returning.